The Australian Government should spend more money on upgrading the rail infrastructure between Melbourne, Sydney and Brisbane, the Australian Rail Track Corporation (ARTC) has said. ARTC CEO David Marchant, speaking at the National Press Club in Canberra, said Australia would become incapable of providing sustainable freight services without dedicated rail freight lines to and from capital cities. Mr Marchant, who has been lobbying the Australian Government to provide a further $830 million on the rail upgrade projects in northern Sydney, said in stark contrast to the investment in making road transport more productive and efficient, the freight rail transport system has been progressively run down. As a result, rail’s share of freight movement between capital cities of Melbourne to Sydney and Brisbane plunged from 50 per cent to less than 12 per cent over the last four decades, while the volume of freight increasing almost 17 times. With freight demand continuing to increase, he said under-utilisation of rail is not viable also in light of the volatility in oil prices and meeting the carbon emissions target. 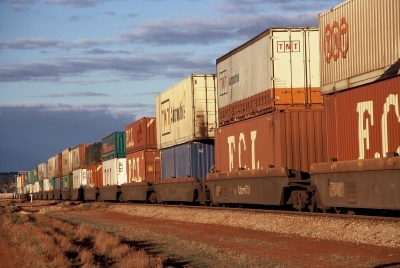 He refuted the recently publicised plan to construct an inland railway linking Melbourne to Brisbane, saying it would have no impact on the freight movement to and from Sydney, at the core of Australia’s logistics operations. He said the rail corridors between Melbourne and Sydney, and Brisbane were “most depleted in performance over the last 30 years” and the ARTC, partially funded by the Australian Government, commenced a major program of improving the infrastructure. He also expressed high hopes for the southern Sydney freight line, with its completion targeted for January 2010. “This line will separate freight from the urban passenger system in Sydney from Chullora to Macarthur. “It will overcome the curfew on freight movements in the southern metropolitan area…and will be connected to the freight line from Chullora to Sydney Ports which will also be separated from the urban passenger system,” he said. The ailing rail system could overcome decades of neglect through AusLink, Infrastructure Australia and the government’s stimulus package, he said. “There’s an ad running on US television at the moment extolling the virtues of rail over road. I’ve converted from imperial to metric the figures used in the ad. “Consider this: a tonne of freight can be carried 680 kilometres using just 3.7 litres of fuel. Road can’t do that. Rail can. “These are not issues that can be solved tomorrow; however, the road map for the adjustment needs to be commenced today,” Mr Marchant said.